We don't recommend that you play at Jackpot Capital Casino. Launched in 2009, Jackpot Capital is a Curacao-licensed casino that accepts players from Australia, although it deals in USD instead of AUD. The casino's Cyprus-based parent company, Greavestrend Ltd, operates several other iGaming sites, including Grande Vegas, Slotastic, and the Lucky Club. 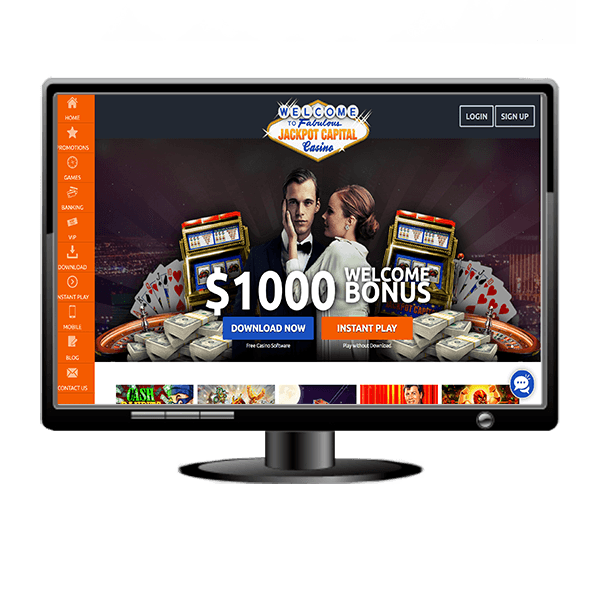 Jackpot Capital is powered by tried-and-tested Realtime Gaming software, which is a popular solution for Australia-facing casino sites. Most of the available games are jackpot slots and standard pokies. The video poker selection is also generous at 14 games; however, with only two roulette wheels and nine blackjack variants, the same can't be said about classic table games. The bonuses are structured in a way that makes it easy to continue playing when luck isn't on your side. You receive up to $100 in bonus money and 100 free spins as soon as you make your first deposit. Even if you bust out, you can get 25% cashback on your net losses and give it another try. Jackpot Capital is all about providing its customers with options. Even if you don't own the latest version of your browser, you can still use the Instant Play option as long as you have Adobe Flash Player installed. If your browser is HTML5-ready, the casino app automatically loads the HTML5 version of the games. You can also install the casino app on your computer, considerably reducing loading times if your internet connection is slow. The biggest problem with Jackpot Capital's games is that they were all designed by RTG. You won't find any slots supplied by other developers, even though the platform itself is compatible with third-party software. The casino hosts 105+ slots, 3 specialty games, 17 table games, and 14 video poker variants, 13 of which feature a sub-2% house edge. The returns on Jacks or Better are slightly lower, so we recommend avoiding this game if you're a profit-oriented gambler. Note that both European and American Roulettes are listed as Specialty Games – the Tables Games section is reserved for card games such as Blackjack, Baccarat, and casino Poker. More than 50% of the available slots are modern five-reel games with multiple paylines, bonus rounds, and special features. Many of these titles give you a shot at winning jackpots that range from about $20,000 to $200,000 and more. The themes are varied – if you want a fantasy adventure, you can choose Witch's Brew; if you prefer glamour, High Fashion is an excellent choice; and if you'd like something exotic, you can always go for Secret Jungle. Vampires, pirates, heists, cute animals – RTG has it all. Jackpot Capital is compatible with both iOS- and Android-based systems. You don't need to download any dedicated gambling software as the mobile app is designed to launch via your mobile web browser. Note that this app does not open as soon as you visit Jackpot Capital's website on your smartphone or tablet – you need to click one of the games to start it up. Once you have done that, you'll be treated to the circular menu of the main lobby where you can access 80+ slots and 20+ of the other games that are available for desktop users. Even on a smartphone with a 5” screen, browsing through the lists and locating our favourite slots was a breeze. RTG games have a small memory footprint, so they should load quickly even when using a 3G connection. The difference between playing on the go and while connected to Wi-Fi should be barely noticeable. Jackpot size is displayed beneath each game’s title in the lobby regardless of the device being used so that you always know where to expect the biggest payout if you get lucky. You can also get in touch with Jackpot Capital's staff using Telegram (mobile only), Facebook Messenger, or Skype by following the links provided in the website's contact section. Jackpot Capital supports credit card deposits and Western Union money transfers as well as Neteller, Skrill, and ecoPayz payments. You can also use Bitcoin or blue (adult) Paysafecard codes, combining up to ten cards for a single deposit. All funds are credited to your account as soon as the casino receives them. Withdrawals are usually handled through one of the e-wallet services mentioned above or via an international wire transfer, which can take up to 15 days. Bitcoin cash-outs are also available, but their speed depends on the network's current state.